Iain Ballantyne reports on a recent salute to a Cold War warrior of the Soviet Union who arguably saved us all from nuclear annihilation. 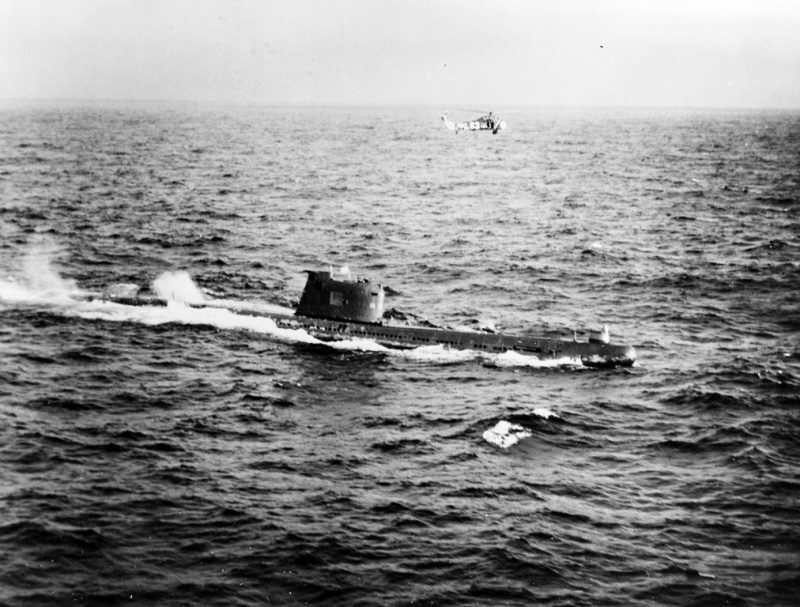 During the Cuban missile crisis of late 1962 a Soviet Foxtrot Class submarine at speed on the surface is kept under surveillance by a US Navy SH-34 helicopter. Photo: US National Archives. The family of a Russian submariner who kept his head at the height of the Cuban Missile Crisis and prevented his vessel’s captain from firing a nuclear-tipped torpedo has been honoured. Second Captain Vasili Arkhipov was one of three officers aboard submarine B-59 who had to jointly agree before any launch of the weapon was permitted. Arkhipov refused and so has been credited by the Future of Life Institute (FLI) with saving the world. On the 55th anniversary of the incident, the submarine officer’s relatives received the posthumous Future of Life Award after the Institute tracked down Arkhipov’s surviving family members in Russia. Arkhipov had passed away in 1998. 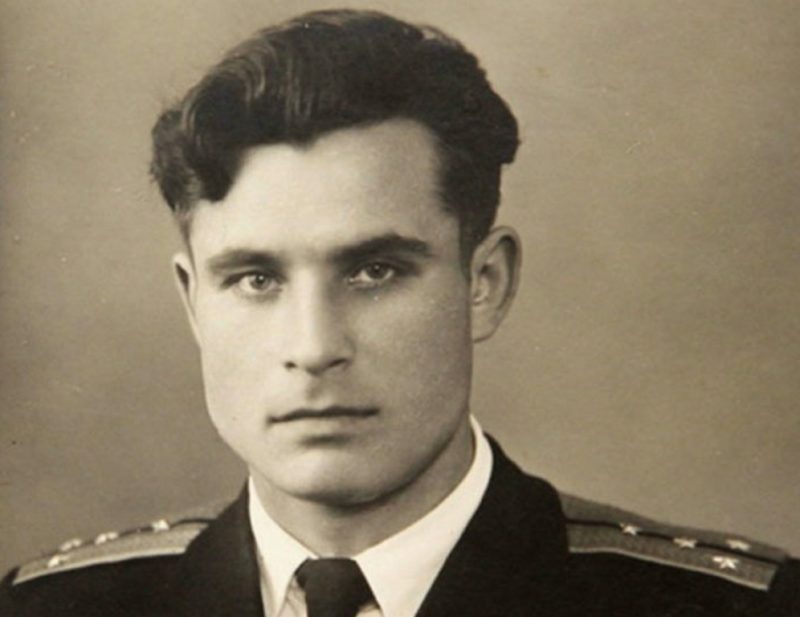 Vasili Arkhipov as a young officer. 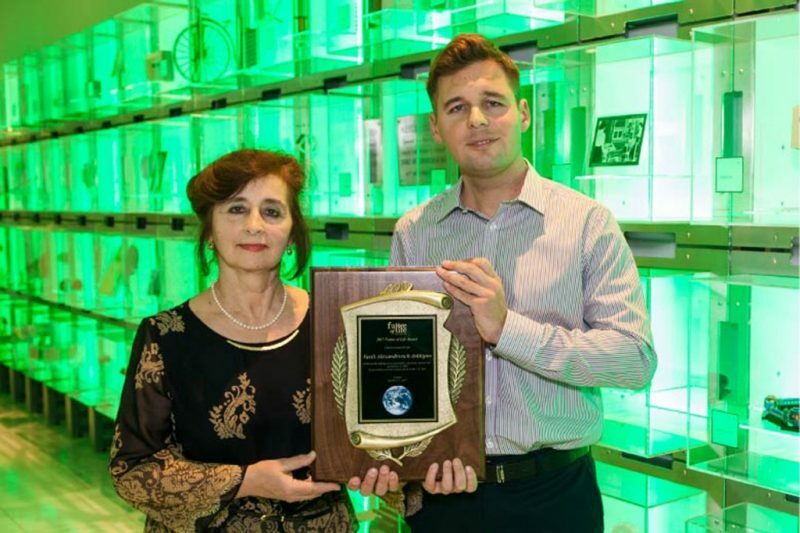 The award presentation was made at the Institute of Engineering & Technology in London, which was felt to be an appropriate venue and easier for Arkhipov’s daughter Elena and grandson Sergei to get to than travelling to Boston, Massachusetts where the FLI is based. On October 27, 1962 the B-59 was cornered by US Navy warships that were enacting a naval quarantine of Cuba to force the Soviet Union into withdrawing nuclear missiles it had based on the island. American destroyers used reduced power charges to pressurize the Foxtrot Class diesel-electric boat into surfacing, also broadcasting demands on their underwater telephones. With air running out, battery juice low and air conditioning switched off to preserve whatever power was left, the atmosphere inside B-59 was almost beyond endurance. The submarine’s Commanding Officer, Captain Vitaly Savitsy, decided desperate measures were needed and ordered B-59’s tactical nuclear torpedo prepared for launch. It was a move that he was authorized to take without further reference to Moscow. However, the captain needed the two other specified officers in the submarine to concur. The boat had been out of touch with the world beyond for many days and for all B-59’s crew knew a state of war already existed between the Soviet Union and the USA. Even so, Arkhipov believed firing the torpedo was unwarranted and stood his ground, refusing to agree, even though the other officer had, so frustrating the captain’s plan. After surfacing, B-59 was escorted away from Cuba by American destroyers, eventually slipping their trail and heading home. The fact that B-59 and three other Russian submarines involved in operations off Cuba were each carrying a single nuclear-tipped torpedo was not known until the early 2000s. When the full story of Arkhipov and B-59 emerged it shocked the world, for if the submarine had fired her torpedo it could have set off a series of nuclear exchanges that might have destroyed humanity. Incredibly, it was not the first time Arkhipov had been involved in a potentially disastrous incident. In the summer of 1961 he was second-in-command of the Hotel Class ballistic missile submarine K-19 when that boat suffered catastrophic reactor failure off Greenland. A nuclear explosion was only narrowly avoided. Arkhipov’s daughter, Elena and grandson Sergei receiving the Future of Life Institute award in London. Photo: Future of Life Institute. B-59’s part in the Cuban Missile Crisis is also touched upon in Iain Ballantyne’s forthcoming book ‘The Deadly Trade: The Complete History of Submarine Warfare From Archimedes to the Present’ (W&N, £25.00 hardback) to be published in March 2018.